Skirts? Dresses?! Um, I'll have you all know I used to wear bike shorts under my dresses in the 90s, I'm pretty sure it was somewhat fashionable and totally "Blossom", but it was also my tomboy rebellion playing a part. Anyway, while I feel most comfortable and myself in jeans (or just some sort of pant/short combo in general), I have definitely grown to appreciate the times I do get more snazzed up. "hey, this isn't so bad.... fashion show time!" yes, a dress equipped with a bow! My $39 sale Urban dress was even mistaken for BCBG... awesome buy! 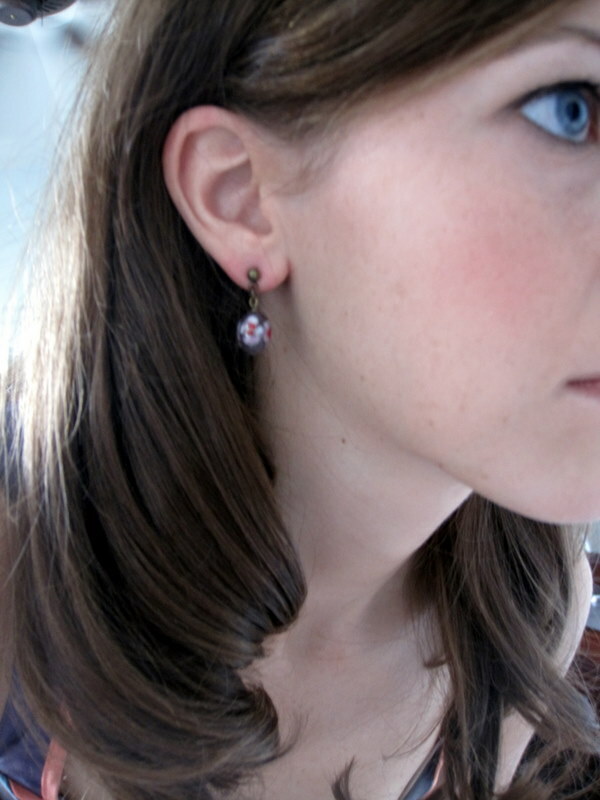 Close up of the earrings, they matched perfectly! So are you a tried and true "girly girl" or do desperately cover it up by neon colored bike shorts?? um. LOVE that dress. i need. The dress is so so cute and looks great on you! I laughed when read about the bike shorts under dresses- unfortunately, I did the same in ol' days!! OMG OMG OMG!!! I love it!!!! See, my suspicions were right, you DO look fabulous in a dress, too! :) The shape is perfect for you, too. I heart. I rarely dress up either (in fact, a reader asked me once why I never wear heels), but I do love when I get the chance to. That dress is absolutely adorable, I wish it were still available in the colorblock. LOVE LOVE LOVE. Further proof that we are shopping twins?? Lol. Sassy - I totally understand why people think dresses are more comfortable (since they are less restrictive), but I guess I'm more comfy in jeans bc I don't have to worry about being 'ladylike'. I'm a bit of a clutz and just generally live life hard -in the sense that I'm the furthest thing from dainty... I have to be so much more careful in a dress. D,S, &H- I was such a dork... like I seriously thought they were 'cool-lots' until maybe like a year ago, bahaha... i'm actually serious. DEA - soo glad I'm not alone, I have great pic somewhere from a piano recital with a floral print peplum dress and hot pink shorts... have to go find it! J - we are def shopping twins! You do look fantastic in that dress, love it on you! The whole look is just fab! Mom - I can't find the pic from the piano recital.. you know, the one where I wore like a turtle neck under that purple flower dress and like pink bike shorts under... you have it?? OMG you are SOO cute!! I love the second to last dress picture! Adorable! That dress is adorable! Looks great on you! But like you I live in jeans. Anything else just doesn't feel like "me," though I will sometimes venture out and wear a dress or skirt if the occasion arises! Amber - I'll take it! Except I'm more like Polly Pocket while you are Christian Louboutin Barbie haha! SweetTea - Thanks! This was actually the 2nd time I wore the dress. I wore it 1st to my g-ma's 90th bday party when I was in LA... pretty sure its coming with me on vacay in June and attending another shower, best $40 dress ever!! Hi Erin, love that dress on you! So pretty. You look so pretty! Sport dresses more often - they look great on you. AND...I've been there with the bike shorts. I also used to wear bodysuits. Yikes.